Sen. Lamar Alexander, R-Tenn., chairman of the Senate Health, Education, Labor, and Pensions Committee, talks to reporters on Capitol Hill Wednesday. "This is a first step: Improve it, and pass it sooner rather than later. 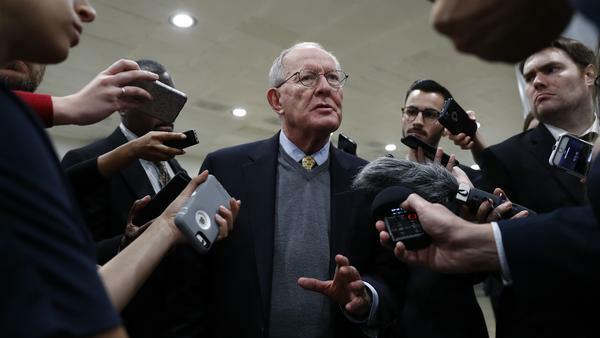 Our purpose is to stabilize and then lower the cost of premiums in the individual insurance market for the year 2018 and 2019," said Sen. Lamar Alexander, R-Tenn., on the Senate floor. Alexander and Sen. Patty Murray, D-Wash., crafted the compromise bill. Alexander and Murray have been working on this legislation for months. Negotiations initially began after the Senate failed to pass legislation to repeal and replace Obamacare back in July. Most Americans get health insurance through their employer or from the government. About 18 million Americans get their insurance through the individual market established by the Affordable Care Act. "They're the ones we're worried about; they're the ones we're seeking to help," Alexander said, noting that includes about 350,000 people in his home state. "I have to say that after seven years of intense partisanship on these issues, which would lead everyone to believe there was no hope for Republicans and Democrats to come together and work to strengthen our health care, I'm really pleased with this common ground we've been able to find," Murray said on the Senate floor. President Trump's decision last week to end subsidies to insurance companies that were allowed under the ACA revived congressional talks. The Trump administration argued — and initial court rulings backed it up — that the payments were illegal because they had not been appropriated by Congress, which has the constitutional authority to spend the government's money. Although the 2010 health care law required insurers to provide discounts to some low-income consumers and said the government would reimburse them, without authorizing the spending. The Alexander-Murray proposal would appropriate those subsidies for two years, and tie them to permanent changes to the law that give states more flexibility to seek waivers from the Health and Human Services Department from the ACA's requirements. It would also allow insurances companies to sell less comprehensive plans to all customers, not just those under age 29 as is the case under current law. The nonpartisan Congressional Budget Office estimates that without the subsidies, premiums will go up, the deficit will rise and up to 16 million Americans could live in counties with no insurance providers at all. "Unless they are replaced with something else temporarily, there will be chaos in this country and millions of Americans will be hurt," Alexander warned. Alexander said Trump has been privately encouraging of the talks, but the president cast doubts on the legislation this week by suggesting it was a "bailout" for insurance companies that he could not support. However, the bill's sponsors counter that the legislation requires that the subsidies go directly to the consumer to keep premiums down. The bipartisan bill has potentially critical GOP support from Sens. Susan Collins of Maine, Lisa Murkowski of Alaska and John McCain of Arizona. The trio played a defining role in the defeat of previous GOP health care bills this year. It also has the backing of Sens. Lindsey Graham of South Carolina and Bill Cassidy of Louisiana, who have competing legislation to dismantle the ACA and replace it with a block grant system to the states. GOP backers say the bill does not pre-empt the party's ongoing effort to end Obamacare but rather buys time to keep working on legislation that can muster enough support to pass Congress. Conservatives have balked at Alexander-Murray as a tacit admission that Obamacare will remain the law of the land. House Speaker Paul Ryan said through a spokesman Wednesday that the speaker believes the Senate should remain focused on legislation to end Obamacare, not prop it up. The proposal puts the GOP in a bind between the policy necessity to act to protect millions of Americans from premium hikes and the political necessity to continue to keep up its effort to dismantle the current system. An August poll from the Kaiser Family Foundation found that 60 percent of Americans think Trump and Republicans in Congress are responsible for what happens to the ACA in the future. Senate Majority Leader Mitch McConnell has not taken a position on the bill, but he is unlikely to bring something to the floor unless it has Trump's support and the 60 votes needed to clear a potential filibuster, which it should if all 48 Senate Democrats support it along with the 12 Republicans who have signed on. The legislation crowds an already limited legislative calendar. It would need to become law before the end of the year when Congress needs to pass a spending bill package to keep the government running. That spending bill would be the vehicle to fund the insurance subsidies. Along with Alexander, Collins, Murkowski, McCain, Graham and Cassidy, the additional GOP co-sponsors include Sens. Mike Rounds of South Dakota, Joni Ernst and Chuck Grassley of Iowa, Bob Corker of Tennessee, Richard Burr of North Carolina and Johnny Isakson of Georgia. The Democratic co-sponsors joining Murray include Sens. Angus King, independent of Maine, Jeanne Shaheen and Maggie Hassan of New Hampshire, Joe Donnelly of Indiana, Amy Klobuchar and Al Franken of Minnesota, Heidi Heitkamp of North Dakota, Joe Manchin of West Virginia, Tom Carper of Delaware, Tammy Baldwin of Wisconsin and Claire McCaskill of Missouri.